The Provincial was re-elected, as was the Provincial Council. 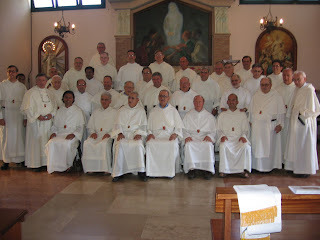 The photo above is the official picture of the Chapter Fathers. Well, friends, it has been some time since my last post on this blog. I hope that you did not give up hope or confidence in this simple exercise of religious mass media. The summer continues to roll ahead. Many of us - the students - are in a state of Diaspora. Some of us are in the midst of our home-visits and others (4 of the students) are on their way to Ecuador to spend roughly 2 weeks undergoing formational classes and experiences to better and/or more fully prepare them for Solemn Vows. Please pray for them as they travel - pray that they may be further enlightened by the Holy Spirit and confirmed even more in their religious consecration.